After a quick train ride from Bologna, we arrived in Florence, the capital city of Italy’s Tuscany region, and birthplace of the Italian Renaissance. We had all visited before, but we had one day (ten hours to be exact!) 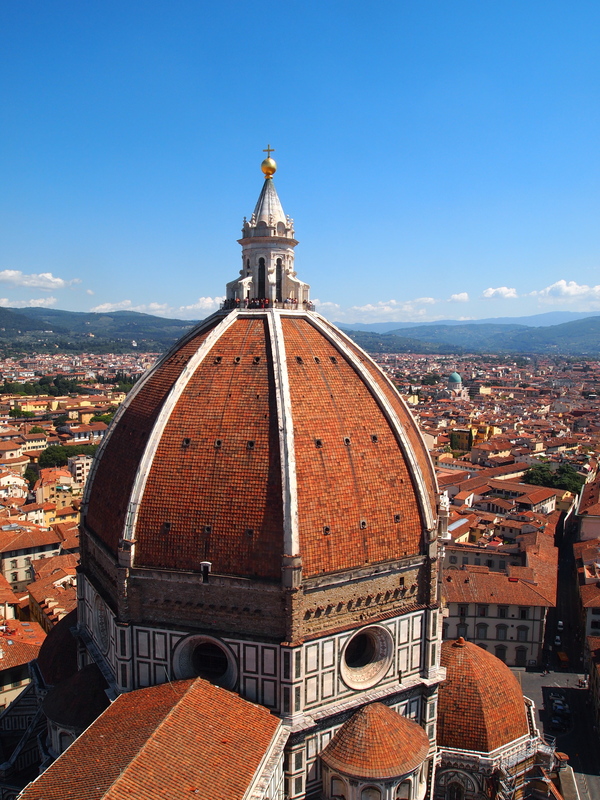 to go through all of our favorite restaurants and iconic sites in Florence. We sat down at Scudieri, a classic European cafe with specialty Italian desserts, pastries, and glamorous Viennese chandeliers. Definitely not the usual breakfast establishment I frequented in the U.S.
(*ahem my favs Perkins and…Annie’s at Dupont in DC) Since it was a beautiful day outside, we got a table out on the patio, where we were misted with water every 30 seconds by these little sprinklers hidden under the big patio umbrellas. They are meant to keep tourists like us cool, but instead just inspired a debate about the perils of toxic lead water in food. 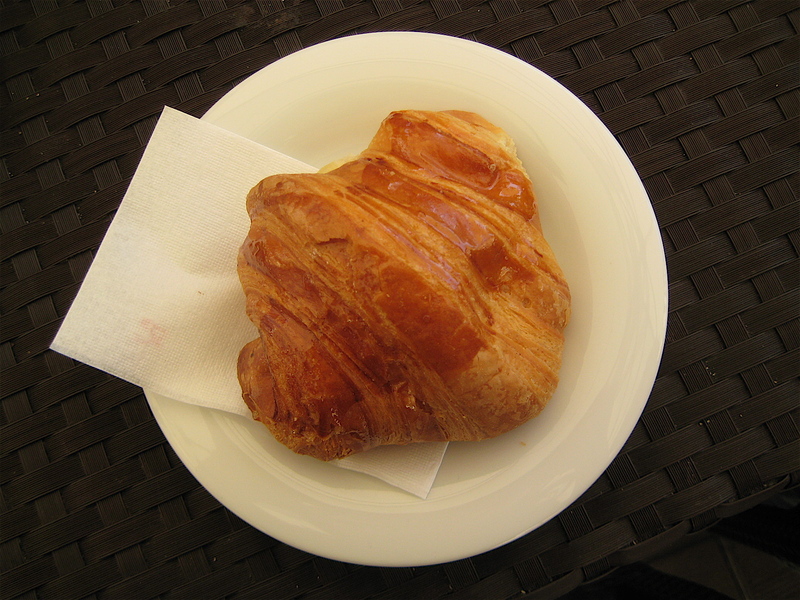 Anyway- day in Florence started with an innocent little puffy croissant. The croissant was crispy on the outside, warm and chewy inside, with a little taste of orange-citrus: the definition of a good croissant, anywhere you go. Paired with a strong macchiato and I was ready for the day. Pietro got a fluffy prosciutto omelette with fresh mâche. 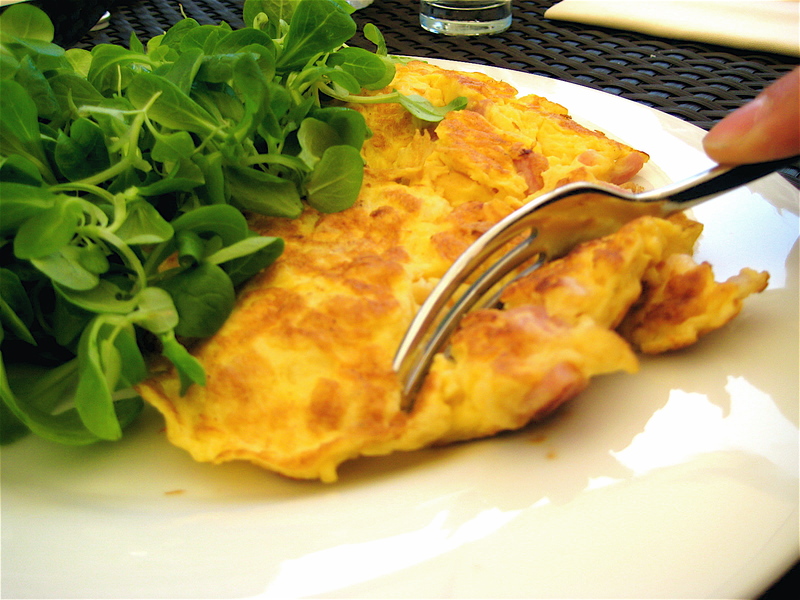 The mache was not seasoned at all because the omelette was flavored with chunks of salty, flavorful prosciutto. You had to get both the mache and omelette in each bite to get the full effect. Delicious. When you walk inside the cafe, you can see platters of small appetizers set up on the counter, and patrons hovering over their espressos while standing up. This is common practice in Italy, as sitting down at a table incurs a cover charge of approximately 2-2.50 euros per person. The platters consist of several varieties of bite-size, crust-less sandwiches, which are referred to as a “buffet”. Now for anyone in America (and elsewhere in the world too), a buffet is something entirely different. A buffet is usually: a) all-you-can-eat, b) served in trough-like bins, c) a smorgasbord of food hailing from different countries, and/or styles of cooking. Ah, America. Of course this isn’t the case for some fancier buffets, but these crust-less sandwiches on the counter– these aren’t the buffets I know and love. Although undoubtedly delicate and tasty. After breakfast, we were ready to re-visit our favorite sites in Florence. 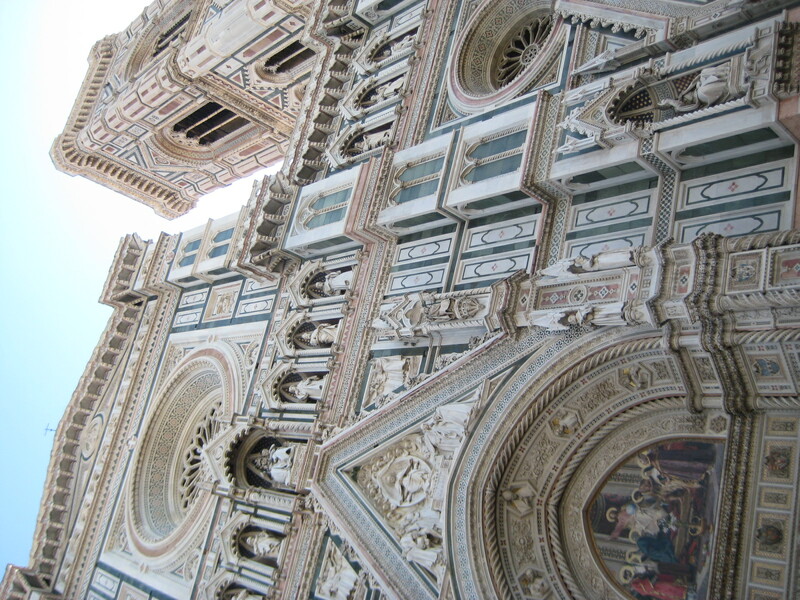 We walked over to the Basilica di Santa Maria del Fiore designed by Filippo Brunelleschi, also known as the Duomo. The lines to enter the cathedral are always pretty long, so for 6 euro each, we opted to climb the 414 steps to the top of Giotto’s Campanile (Bell Tower) for an amazing view of Florence. It is also possible to climb to the top of the Duomo (463 steps), but then you would only get the view of the tower and not the cathedral itself. This climb might not be for the faint of heart, or the claustrophobic, since many portions of the staircase spiral around in some cramped spaces, but I did see a woman with her foot in a cast and some seven year olds successfully get up to the top, so…basically I think it should be manage-able by most! And did I mention it is totally worth it? Santa Maria del Fiore, photo credit: Pietro M.
The only advice I have is to bring lots of Purell, or any other antibacterial hand sanitizer. No, seriously. It is a long way up to the top and you are gripping pretty much the same walls that have been around since the 1350s, aka the same walls that have been touched by millions of germy tourists that have made their way through. Think about it. 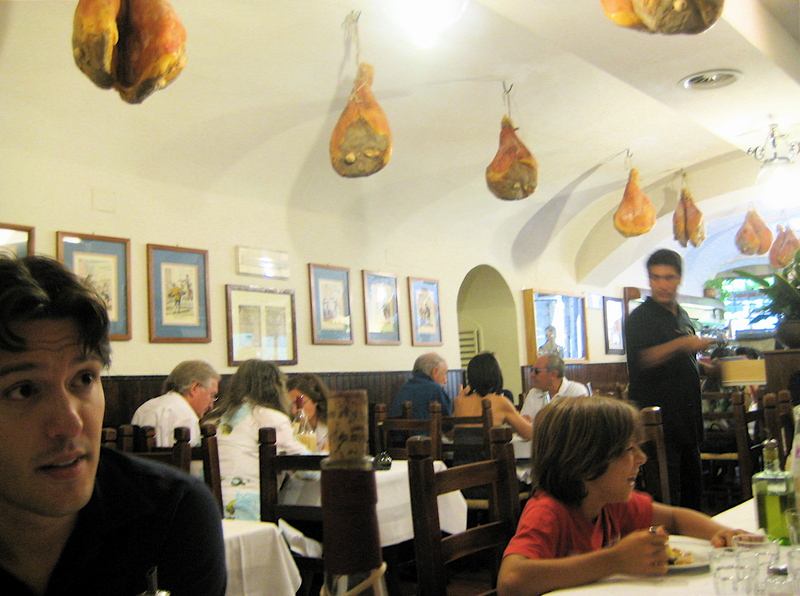 Il Latini is one of Florence’s most beloved and well-known restaurants. The interior is rustic, with prosciutto hanging from the ceiling and jugs of red wine on every table. There was an Italian kid sitting next to us who was fiercely defending his dessert from his own father. Sadly, I understand how the kid feels. This is how scary people can get when they come here, it is that good. We weren’t presented with any menus, as the waiters just proceeded to give us what was fresh at the restaurant that day. 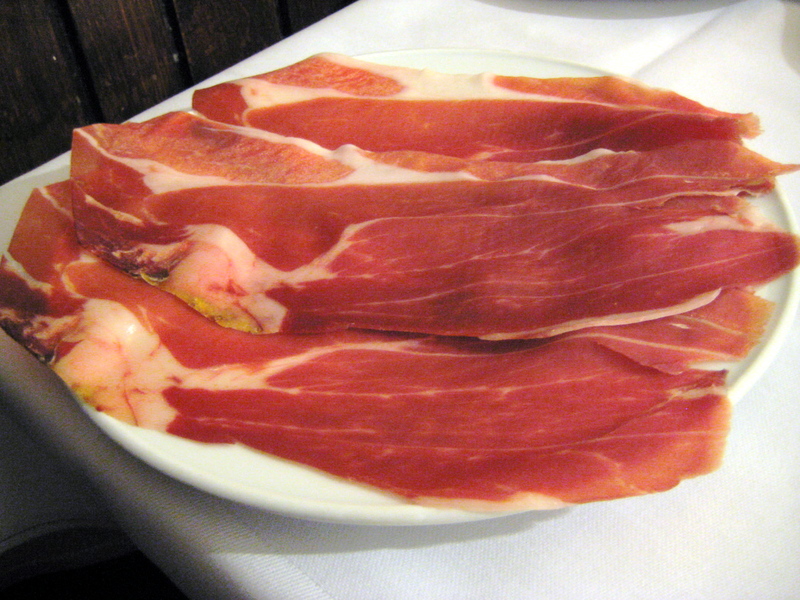 First, they served us large strips of fresh, thin-cut prosciutto crudo, accompanied by slices of cantaloupe. You wrap the prosciutto around the slices of cantaloupe and eat it together, for a great savory and sweet flavor combination. Along with the prosciutto crudo came a variety of other amazing antipasti. 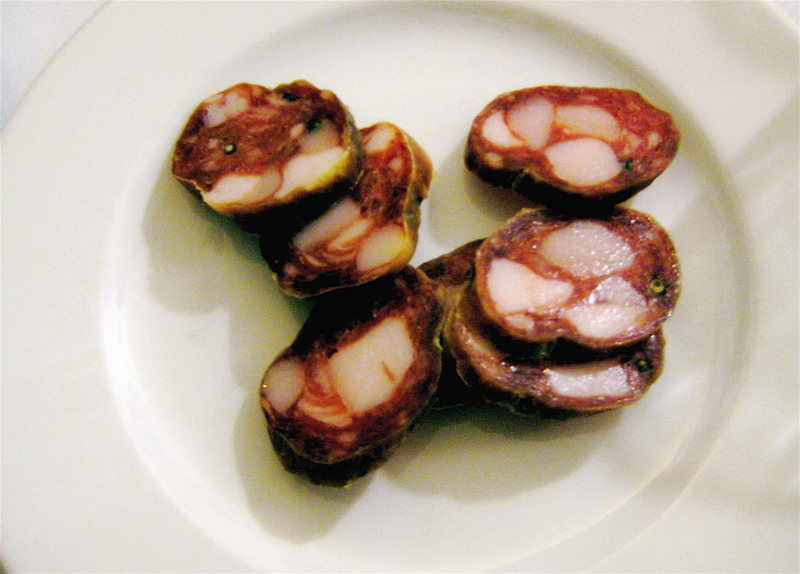 The Italian salami was another fantastic example of meat curing techniques and great recipes that have been perfected and passed down through time. Texturally, it was quite dense and tough, as salami should be, but the cured flavors presented themselves when I ate it with the fresh bread. The large, white squares of fat were especially flavorful and provided a softer texture to the overall denseness. They also brought us buffalo mozzarella with tomatoes over some salad greens, and a basket of fresh bread. For the primi piatti, we ordered three different types of zuppa, or thick soup. Many varieties of zuppa are made from leftovers, such as day old bread, meat, or produce, that is still edible of course, and incredibly rich in soup form. We had a tomato bread soup (see below, right); ribollita, a soup made entirely of leftovers which included cabbage, kale, tomatoes, and other ingredients; and a creamy barley, tomato, white bean soup that was infused with fresh rosemary. 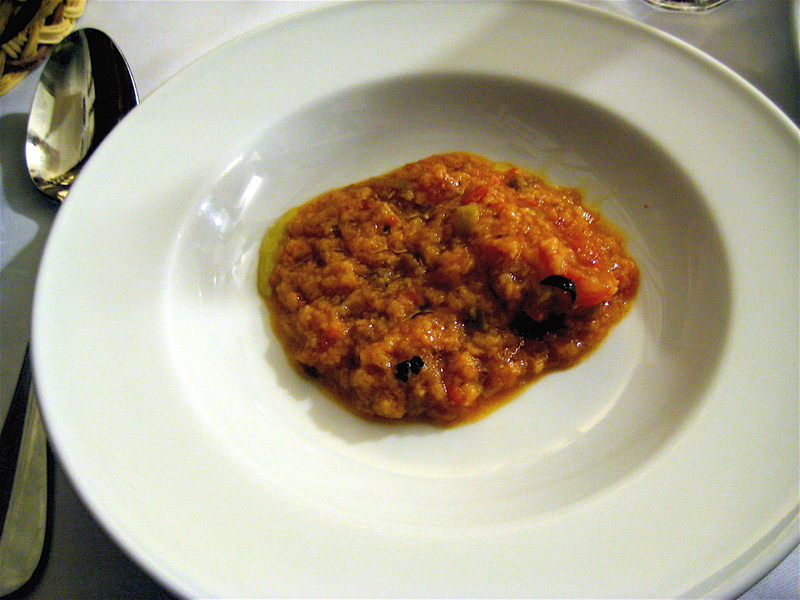 We were instructed by the waiters to drizzle olive oil on top of each soup before eating, which enhanced its flavor. For more information on the origins of ribollita…please refer to the Food Explainer. I was told that Florentine bistecca was a must have. I did not know that it was essentially a Fred Flintstone brontosaurus steak, but it was glorious! I think it was the size of a baby, which meant we had to hold it up and support its head while photographing. 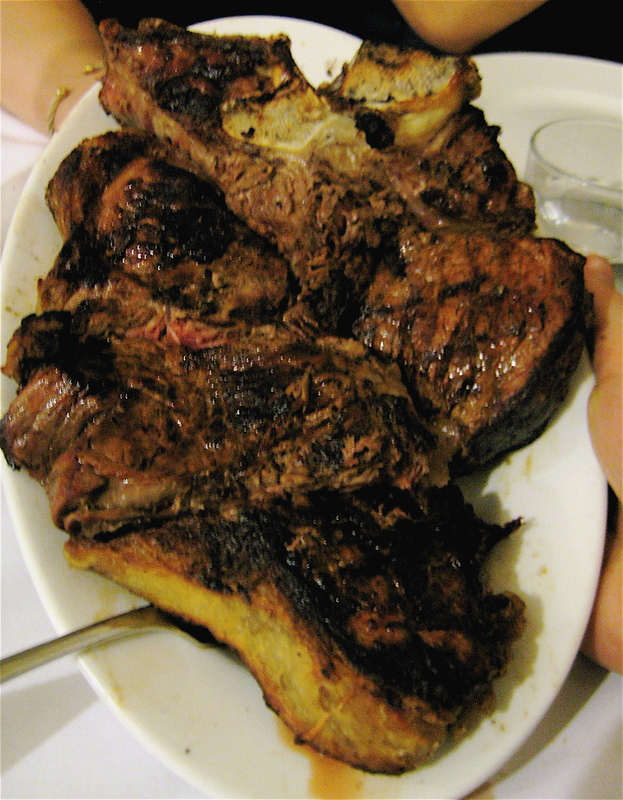 The steak was unbelievably good– very tender, juicy, and of course flavorful. At this stage of the meal, we were all already pretty stuffed with antipasti, zuppa, and various beverages, but I could not let this steak down. I was craving steak the night before after watching an episode of Top Chef, and all I wanted to do was eat this amazing dinosaur-sized steak, which I did to the best of my ability. Throughout the meal, the waitstaff was very warm and helpful. They overheard us practicing Italian and joked about how they wanted to take Italian lessons from Professor Pietro, and told us about their Italian cousins in Philadelphia. We had a great time, and ended up getting some more dessert drinks, biscotti and vermouth, and two delicious torts. All in all, a fantastic, traditionally Tuscan meal. We walked around Florence a bit more, and saw the Palazzo Vecchio, the castle-like town hall of Florence and the Piazza della Repubblica, a city square close to shopping (all the main luxury brands, chains like H&M/Zara, as well as some local Italian shops). As it was pretty hot out, we stopped by the Grom gelateria or gelatto shop, which by the way recently made its way to the West Village in NYC. By the end of our time in Florence, we were all tired, content, and still full from the super Tuscan lunch extravaganza. We took the train back to Bologna and walked home, and yes we stopped by for a slice of pan pizza on the way. This blog shares my love for food, travel, and curiosity for food history and knowledge. 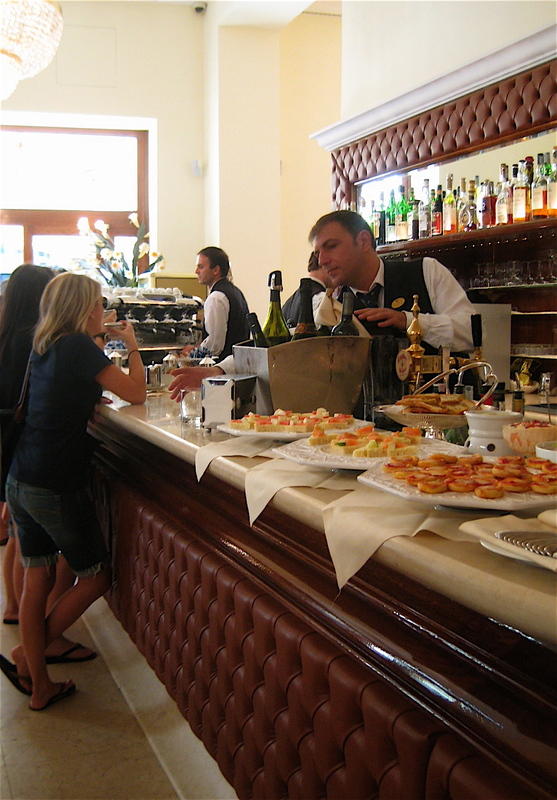 As I travel from Italy to other countries, I will document food discoveries and recipes from around the world. To learn more about the origins of specific dishes, food rituals, ingredients, and cuisines, please visit the Food Explainer section of the blog. I welcome all of your comments and hope you enjoy reading as I enjoy creating! La Gourmande · food and travel discoveries from around the world.